The idea here is that if someone wants to know if the Book of Mormon is true, he should apply Moroni’s promise. The result will be certain knowledge in the affirmative, imparted by the Holy Ghost. In Mormonism, this is called a “testimony.” Sounds good, but in real life it doesn’t always work out the way Moroni promises. “1. He should read and ponder the Book of Mormon—all of it. “2. He should remember the methods God has used in working with the peoples of both the Book of Mormon and the Bible—and ponder these things in his heart. “3. He should put himself in a frame of mind where he would be willing to accept (receive) all of ‘these things’—the Book of Mormon, the Bible, and the way God works with men. According to Dr. Ludlow and countless other Mormons, if someone reads the Book of Mormon and does not receive a testimony of its truthfulness, something is wrong with the person – he missed a step, he wasn’t sincere, he didn’t have enough faith, etc. While I fully agree with Dr. Ludlow’s statement that, “God cannot and does not lie, and his promises made through his prophets are sure,” I recognize another distinct possibility in the case(s) of the failure of Moroni’s promise. Dr. Ludlow neglects to consider this option; nevertheless, if God does not lie and His promises are sure, the failure of the Book of Mormon’s promise in Moroni could very well indicate that God never made that promise in the first place. This represents a perfectly valid conclusion, but in my experience, Mormons won’t consider this alternative. It’s easy to understand why. If God is not the author of Moroni’s Promise: the Book of Mormon is not what it claims to be; a Mormon’s “testimony” becomes untenable; Joseph Smith is revealed as a false prophet; and The Church of Jesus Christ of Latter-day Saints can no longer be sustained as God’s kingdom on earth. These are hard truths. But isn’t truth what we really want? Isn’t truth what we need? This entry was posted in Book of Mormon, Truth, Honesty, Prayer, and Inquiry and tagged Book of Mormon, Church of Jesus Christ of Latter-day Saints, LDS Church, Mormon Church, Mormonism, Moroni 10:4, Moroni's Promise, proselytizing. Bookmark the permalink. I think this is a fundamental flaw in Mormonism and a tactic that is so easily manipulated. Its a self serving promise and the only acceptable answer to the faiths adherents is that it supports itself. They cannot fathom someone ‘praying’ and getting a different answer. But within Christianity, I can think of millions of ways someone can come to Christ, and even those who pray the ‘sinners’ prayer are not necessarily Christian. I call Moroni’s challenge a fool’s errand because there’s only one acceptable answer in the eyes of a true believing Mormon. So they get the prey engaged and then set about to have him/her chase their tail in a circle round and around. I’ve often had Mormons challenge me with the, “How do you know it’s not true if you haven’t read it?” I tell them that despite what they think, it’s possible to know if the book is true or false without reading it. What they are hoping is that I will read it and suddenly get the burning in the bosom confirming, in their paradigm, that it’s true. I don’t discount that there are probably things in the BoM that could make someone feel good. The fact that Joseph Smith copied huge portions of the Bible, particularly the Book of Isaiah, demonstrates that there is truth contained in the BoM. However that’s just bait. Anyone who is depending on the emotional experience they got when they read the BoM to confirm that it’s a historically accurate narrative, needs to dig a little further. I think that former Mormons who are now Christians can best give an answer to these Mormons who think that Satan led them astray. Everyone of these folks are closer to Christ as a result of rejecting Mormonism and the BoM. When they bring up the prayer challenge, I respond with, “it brings me a feeling of repulsion, blasphemy and death”, which it does. For some reason they take offense to that. Emotions are often manipulated by media, but I don’t watch a movie that made me feel good, then go round and proclaim it as “the One True Movie” and start going door-to-door proclaiming it’s truth. I’ve run into this a couple of times, too. What I tell the elders (the truth) is that I read the BoM, prayed about it, and received a reply (both as an intuition as well as the obvious message of the Bible): “you have a brain I gave you, it works reasonably well, you have more than enough background (in faith, catechesis and sanctification) to judge it, so what do you think? Is it of My Spirit, or not?” The answer, of course, is “no, I think it’s a mildly interesting work that tries to address early 19th century religious problems using semi-Jacobean English and a general plot cribbed from Judges, with a patina of New Testament Christianity layered lightly over the top”. Heavenly Father then replied (in my spirit), “well, maybe you should go with that…”. My wife occasionally says, “too wishy-washy, tell them they’re heretics (nicely) and move along.” They still keep dropping by occasionally, however (I’ve gone through about 6 pairs, a mission president and a stake patriarch), so hopefully it’s doing some good. It would make someone feel super spiritual to think they had prayed about something and God rewarded them with an intense feeling, causing them to believe that the BoM is true. That would be some jet fuel to get the prospect to jump head-long into the LDS program. Interestingly enough, Moroni’s promise, if someone takes it seriously just covers the BoM doesn’t it? I don’t see anything in the promise that indicates the prospect has to join the LDS church and pledge allegiance to Joseph Smith, the LDS church and the current prophet. It would appear these things were added on. Can the BoM be proven to be true by empirical evidence? Is there any linguistic or archaeological evidence that the BoM is an historically accurate book? There’s been a lot of back-peddling since the early years of the BoM. Not only has it been changed countless times, but the early claims have sort of been under-going constant redo. I would be interesting to say as an experiment, “yes, I’ve realized it’s true, and I’m off to be baptized in the Community of Christ” (or FLDS). Don’t know what the response would be. It’s easy to see why so many people have gotten a good feeling after praying about the Book of Mormon given the fact that it contains hundreds of verses straight from the Bible . Any person with even a little background of hearing the Bible preached , or of once being a child in Sunday school would naturally think the characters in the Book of Mormon were actual prophets or disciples who were taught by Jesus just like in the Bible . The salesman techniques that Mormon missionaries use when teaching their lessons to those they are seeking to convince that the Mormon church is the only true church or to convince them that the Book of Mormon is holy scripture , are tools in the way of manipulating people . People just are’nt recognizing what’s happening to them as they listen then do what the Missionaries ask as they go through the carefully crafted presentation . I always wondered why the Missionaries used the Book of Mormon instead of their other ” scripture” namely the Doctrine and Covenants when teaching their lessons . But after I saw how they conduct their lessons it became clear that the Book of Mormon is the bait preferred . [ The Testimony of a former Mormon Missionary , by Lewis Price , a tract published by the Utah Christian Tract Society ] . Better yet, how about saying that God had revealed to you that Warren Jeffs is the real modern day prophet of Mormonism and the restoration? That quote by Lewis Price is excellent. I’ve mentioned previously that on my visits to Mormon sites the LDS folks are constantly using techniques to stir up the visitors emotions. The tours are often conducted by cute little gals barely out of their teens, many from other countries. And man, can they turn it on. They don’t make them any sweeter or sincere. When I was at the museum in Omaha I was standing by the greeters’ desk and this older lady comes from out of no where carrying this huge Bible and she rushes up to the guy behind the desk and says something like, “……well it says in Matthew…..”, the whole point was to get me to think that they were this Christian group. It was so apparent to me what they were up to. So Lewis Price is right because the whole idea is to seduce the prospect with emotions making them think it’s some sort of spiritual prompting. Well that was pretty spooky. Man, check the guy’s eyes. But here’s the thing. There was/is a Christian group that used the same technique to get people to give money to their organization. It was “seed faith”. Give money to the organization and reap a blessing. They targeted folks in the lower socioeconomic strata and would send them a letter. The instructions were that they were to go to a private place immediately and not show anyone the letter. A giant scam. Do the LDS missionaries really want people to check out the history of the sect and its founder? I have a relative a copy of Jim Spencer’s book “Beyond Mormonism” to pass on to a friend who was going through the missionary lessons. She got half way through Jim’s personal account of his conversion and life as an LDS and cancelled the rest of the meetings. She saw how she was being manipulated. Most of these missionaries are kids who are ignorant themselves but true believers. Mormons like to claim that if the Book of Mormon is true then that proves the Mormon church today is Jesus’ one true church . However, that is not necessarily true at all . When we look at Mormon history we see Joseph Smith starting a new church and introducing the Book of Mormon as scripture . Mormon missionaries were sent out with the Bible and Book of Mormon to preach the truth about God , Jesus , and how to receive complete salvation — it was the gospel . corrupted rendering it a false gospel . are not taught in the Book of Mormon , yet in the beginning it was advertised that the Book of Mormon contained the fullness of the everlasting gospel . But instead of containing the spiritual food that is the full meal deal the Book of Mormon only amounts to a hors-doeuver when it comes to providing complete nourishment for receiving eternal life . Joseph Smith drifted into personal apostasy and caused many to follow him . That malady still remains today among Mormon hierarchy , and many LDS are discovering that to be the case . The Mormon people have been misled by their leaders into accepting not Jesus’ restored gospel but rather a substituted gospel . The truth about how to gain a right relationship with God and receive eternal life from Him is available in the Bible . The same gospel of salvation (Rom 1:16 ) that saved sinners in Paul’s day still is available today and still offers a full salvation to all those who embrace it . That is what our Mormon friends need to know . No need for the latter days prophets of Mormonism at all . The Book of Mormon contains the purported stories of three different groups which sailed to the Americas. The Jaredites (Book of Ether) came to the new world at the time of the tower of Babel. They were instructed to build eight barges in which to sail to America. This journey took three hundred and forty four days. After years of occupying the land and numbering in the millions, their civilization was destroyed by war. The last survivor, Coriantumr, was found by the Mulekites sometime before 200 B.C. The Mulekites came to America from Jerusalem in 586 B.C. They were led by the last living son of Zedekiah, Mulek. Although they lived in America during the same period as the Nephites and Lamanites, they did not encounter them until around 200 B.C. They then became amalgamated with the Nephites. The two main groups in the Book of Mormon are the Nephites and Lamanites. The story tells of a family group led by an Israelite prophet named Lehi. He is warned by God to flee Jerusalem at 600 B.C. He and his family make their way to the southern part of Arabia where they build a ship to sail across the Pacific Ocean to America. Two of his sons, Nephi and Laman struggle for leadership. This leads to the division of the group into two warring factions, the Nephites (usually the good guys) and Lamanites (usually the bad guys). The last battle between the two groups, in 421 AD, wipes out almost all of the Nephites. Moroni, the last surviving Nephite, buries the records of his civilization in the hill Cumorah. 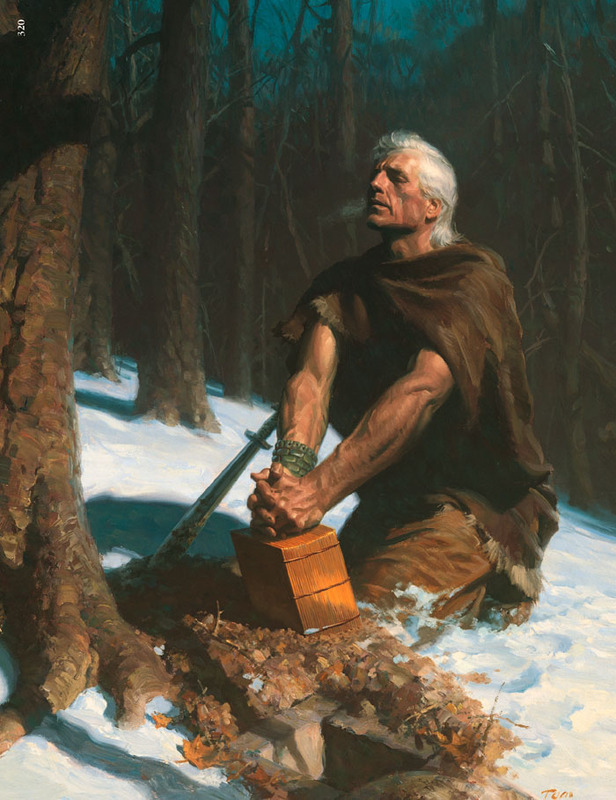 Hundreds of years later, Joseph Smith is directed to the spot by Moroni (some records say Nephi), now a resurrected being who has become an angel. So my question is, “What are people supposedly praying about when they are seeking a feeling that will confirm that the BoM is true?” There are those Mormon sects that contend that shortly after producing this true revelation, Joseph Smith went into apostasy. Not a bad conclusion for a Mormon believer to make. If the original doctrines were changed, even within the believers world an apostasy by the “prophet” wouldn’t be out-of-bounds. If the BoM is suppose to testify to the Lord Jesus Christ then wouldn’t it follow that that is what those who embrace the BoM as true ought to be focused on. As far as Mormonism goes, the Community of Christ probably comes as close to the original as can be found in the world of Mormonism. Even at that, they concede that there are problems with the BoM. I had one young man tell me that his congregation doesn’t emphasize it all. He said he couldn’t remember the last time it was referenced in a worship service. Once things start eroding within the believers mind regarding the veracity of the BoM, it isn’t long before it all gives way in a torrent of realization that it isn’t true. The one thing that the LDS are hoping, since their whole program in recruitment is based on getting the burning in the bosom, is that they can get the prospect to read the book. I’ve posted some general information about the BoM above so I can recite to the LDS missionaries what the (BoM) plot line is and what the obvious problems with the book are. That wouldn’t be enough for them. So my question for them would be, “Do you want me to read a book that’s obviously false in the hope that I’ll get a good feeling?” I would also ask them if they would recommend me joining the LDS church despite the fact that I know the book is false and that I have no testimony to it or Joseph Smith, the LDS church and the current prophet? If not, do you want me hanging around the ward? This young LDS man that I know kept telling me that I had it totally wrong about his church and I needed to come and visit, “How about Friday night when we’re having a baptism?” he asked. I had previous plans but how long would they put up with me anyway? I too was once invited to visit a Mormon Ward . Years ago I was witnessing to my Doctor and he said I should come to his church ( Ward ) and see what Mormons are like etc . I told him that I had bought a lot of books by Mormon authorities and was able to see what Mormonism teaches and so if I attended church with him would I hear anything at odds with what I had learned ? He said no . So I declined his offer . He knew that I had learned about Mormon doctrines what most people never hear from the Missionaries and so by inviting me to his church his friends could show a ton of friendliness towards me which is a powerful tool that can persuade non LDS into looking past the strange doctrines of their leaders and accepting Mormonism because of how nice Mormons are etc . Well , I already knew that the vast majority of Mormons were probably decent people , but that is not where non LDS should look in testing the authoritative claims of Mormonism . That’s a trap that many uniformed non LDS can fall into . That reminds me of the time Andy Watson went to an outreach at a Mormon ward that he had learned about from a flyer the group had distributed. It was one of those, “come and see the wonderful programs we offer” type of approach. So Andy is making the rounds and begins interacting with a couple of boy missionaries. It was long before the alarm went out and the bishop came bustling down to the display area. These folks weren’t about anything but sea shells and balloons. Good feelings and cotton candy. What those LDS were going to do to you when you showed-up was love bomb you. You’d think you were the most important person in the world. THE HIT AND RUN. Far and away the most popular love bombing strategy, this technique is designed to insult without offending. The subtypes are legion, but better known examples include the-loaf-of-bread-on-the-doorstep, little-paper-hearts-with-affirming-messages, casserole-in-a-throwaway-pan, and spiritually-correct-book-in-the-mail. The idea here is that a random, even bizarre, appearance of a book like “Easy Answers to Gospel Questions” is bound to be provocative. Perfectly anonymous, the bomber is assured that the SpiritЎ will take it from there and the apostate’s stone heart will be warmed back into full fellowship, Book of Abraham notwithstanding. Not feeling right about temple plagiarism, have a casserole. Although counterintuitive, such techniques have long been considered successful in anecdotal accounts from Saturday night stake conference vigils…. The Mormon people need to understand the seriousness of what happened in their church soon after it was established in 1830 . Joseph Smith drifted into serious error by introducing aberrant teachings to his flock . His personal apostasy influenced many sincere people . Brigham Young did’nt stop Joseph’s man made doctrines . Joseph Smith drifted from the truth by running past the Book of Mormon’s testimony of God ( one example )with his new doctrinal innovations . Ironically the Book of Mormon describes his behavior — he went ” looking beyond the mark ” [ Jacob 4:14 ] . Praying about the Book of Mormon is unnecessary in order to test the latter days prophets of Mormonism today . A proper test is to apply the apostle John’s counsel in 1 Jn 4:1 in evaluating Mormon leaders , and any prophet we may encounter today . Why ? Answer: Matt 24:11 .